Term that refers to barnyard fowl, most of which have been domesticated for centuries and are now mass-produced. The magret, or breast meat, can be roasted, fried or smoked; they are force-fed to produce foie gras. Often force-fed to produce foie gras, it is delicious stuffed or served with a fruit sauce; goose stuffed with chestnuts is a classic European dish. Prepared like chicken although its meat is drier; in North America, turkey with stuffing is the traditional Thanksgiving and Christmas meal. Young rooster, castrated and fattened for slaughter; it grows to twice the size of a chicken yet has tender juicy meat. 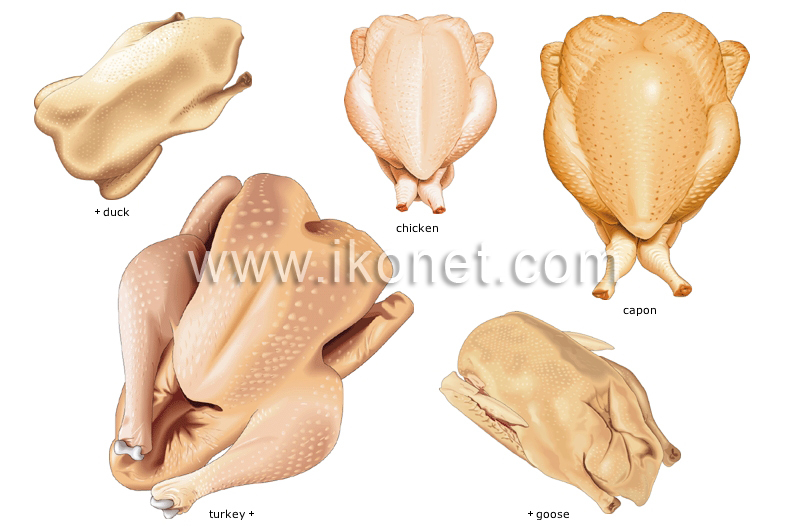 The offspring of a hen, from 4 to 12 months old; it is cheap, tasty and can be prepared in numerous ways, thus it is the most popular type of poultry.